IoT and IoT driven devices are becoming all pervasive with everyday objects being equipped with identifying, sensing, networking and processing capabilities. Gartner,Inc. estimates nearly 20.4 billion connected things by 2020 and these include everything from networking devices, house hold appliances, wearable devices, health monitoring implants to heavy industrial and commercial applications. The convergence of wireless technologies,the internet and sensors has led to the evolution and phenomenal proliferation of IoT and IoT devices. This is further fuelled by newer technology trends like block chain,vision technology, AI and machine learning. The massive amounts of data that these devices generate places an ever -increasing demand on connectivity and cloud infrastructure. Based on research efforts of Prof. Mung Chiang and Prof.Junshan Zhang and Kaushik’s vast experience of working with world leading companies to solve large and complex problems using Technology, the three founders of Smartiply worked on leveraging Fog Computing, Machine Learning and AI to solve this challenge in the IOT domain in a cost-effective manner. This vision of Smartiply Inc.,a	technology start-up company headquartered in New Jersey, USA is to provide “IoT for the rest of the World”. The company is backed by Wistron Corporation, a global leader offering ODM (Original Design Manufacturing) services. Smartiply’s focus is not just on providing IoT solutions to Fortune 500 companies but to provide cost effective solutions to organizations of every size by allowing them to backward integrate with their existing physical infrastructure. To enable this vision in the most expedient way a subsidiary was launched in Mumbai. Smartiply India was set up as an emerging markets hub to cater to India and other emerging markets. The subsidiary has within a short period of time seen good traction in building a sizeable customer base and entering into strategic partnerships with leaders in surveillance industry and smart cities domain - a clear indication of a great product market fit. The team started with a focus on business and market development but has now evolved to support in product development, R&D and in operations support. Smartiply IoT Platform effectively addresses all the key challenges namely -connectivity, latency, affordability as well as security. The platform has been designed to be OS, network and form factor agnostic. Smartiply platform has been successfully deployed on a large scale on IOT Gateways and mobile devices. The platform uses fog computing to enable IoT devices to communicate, collaborate and share resources in an ultra-secure manner. The device simultaneously uses multiple channels – wireline and multiple cellular connectivity to provide robust and boosted data connectivity between IoT devices and the cloud. The solution has in- built redundancy and data can be transmitted efficiently, without interruption even in poor network connectivity conditions. The solution provides for ultra-high security as the data is fragmented and transmitted over multiple channels. Powered by fog computing, Smartiply's IoT gateway, provides powerful computing capability on the edge. The device can analyse data from cameras and sensors and enables decisions to be made locally instead of doing it on the cloud. Other features include expandable storage, network video recording, indexing, tagging, and retrieval functionalities for videos. It offers users comprehensive content management capabilities via a web portal which also facilitates configuration, diagnostics, system status, alarms, firmware upgrades and user permissions management on multiple devices remotely. The gateway allows integration with a variety of devices, wired or wireless sensors, speakers, microphones and many other emerging technology devices. The IoT Gateway also allows third-party software to be integrated via Smartiply SDK offering immense flexibility to build and deploy customized solutions for various use cases. Unfair Advantage Speaking about	the company, Kaushik adds, “We are truly a customer driven company; we closely collaborate with customers to understand their pain points related to IoT deployment and their invaluable insights have enabled us to build solutions that are highly valued in the industry. That’s how we operate; we seek out the toughest IoT connectivity, reliability, or survivability problem, and we tackle them.” Starting off their operations in the United States, Smartiply Inc. explored opportunities globally but the poor quality of infrastructure and the unique combination of economics, eagerness to adopt enabling technologies and scale, made India a favoured destination for Smartiply. The company soon established a strong foothold in the country with its subsidiary, Smartiply India which since its inception has been a significant contributor to the company’s growth. 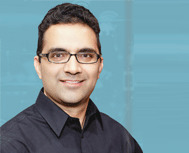 “Our vision is ‘IoT for the rest of the world’,” shares Ravi Shankar Pooli, Managing Director-Smartiply India. He adds, “Our priority is the 99% of enterprises that in sharp contrast to the 1%, have not been able to rapidly deploy and leverage the benefits of IoT. We are focusing our energies on making sure that a large proportion of the 20.4 billion IoT devices are supported with our IoT Gateways. We believe we can help speed up the adoption world-wide by several years”. He further adds, “One of our big strengths is our team that has some of the best and brightest minds working to solve this complex problem by stretching the boundaries of technology. Leveraging fog computing to lower dependence on connectivity and physical infrastructure and enabling decision making at the edge, is a paradigm shift that we are enabling.” Positioned amongst the very few start-ups who managed to successfully market, Kaushik identifies the high calibre Smartiply team as one of the major contributing factors that enabled the firm to emerge as a promising has established strong partnerships with large and has over 800 deployments in the country of time. The team has worked efficiently covering use cases and successfully deploying the solution across industries – Banking and Financial Services, Service Restaurants, Warehousing and more. Strengthened by the success in these industries, Smartiply is now steadily making its way into newer domains like oil and gas, e-education, healthcare and other industries which are plagued with challenges relating to connectivity. The company is also gearing up for commercial launch of the Smartiply Mobile App, architected to provide mobile users with aggregated bandwidth either by leveraging a nearby WIFI connection or through friends and family using the app in proximity. Smartiply promises a seamless experience for watching videos, browsing or transacting irrespective of the quality of the network. The app can be deep integrated by handset manufacturers with video applications and applications that are time sensitive like banking transactions, online ticketing and many more. In conclusion Kaushik added “We are focusing on breaking down affordability, availability and reliability barriers in IoT deployments in the areas of public safety and security, education, healthcare, agriculture, energy management - things that really matter to most of the world. There has also been a surging demand for video surveillance services over the last few years for monitoring security, hygiene and standard operating processes for ATMs, Bank branches, warehouses, residential and commercial areas. Poor networks and related downtime has been a major challenge for e-surveillance companies in averting security breaches and maintaining SLAs. The secure multi-channel boosted connectivity solution provided by Smartiply IoT Gateway provides uninterrupted video streaming even in poor connectivity situations. With high-end machine learning, AI and Video Analytics features, Smartiply enables e-surveillance companies to instantly detect suspicious behaviour and avert incidents.